On Monday nights there is a pet loss candle ceremony. 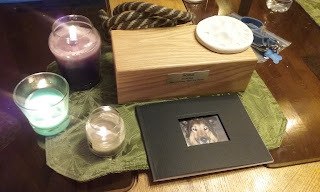 When Scout's ashes came home, we participated in the ceremony. It has been a month now since Scout crossed the bridge. He is greatly missed and thought of often.